Death Valley Junction is a small community in the Amargosa Valley in California. 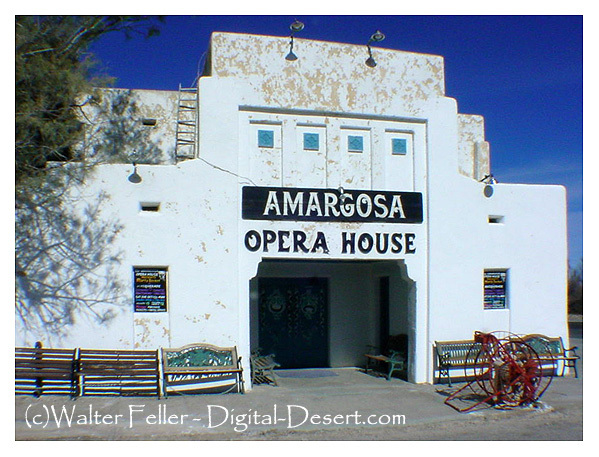 It is home to the Amargosa Opera House and the Amargosa Hotel. Death Valley Junction is at the intersection of Highways 190 and 127, just east of Death Valley National Park. It is located in Inyo County. In 1914 the Death Valley Railroad started operating between Ryan and Death Valley Junction. It carried Borax until 1928, when operations ceased. In the early 1920s, The Pacific Coast Borax Company constructed buildings in the town. Death Valley Junction was christened into being due to the construction of the Tonopah & Tidewater Railroad, then building north from Ludlow, CA, en route to grander plans by the Pacific Coast Borax Company to cash in on the Tonopah / Goldfield / Bullfrog booms to the north, and to service their own borax mines on the eastern fringes of Death Valley, near Greenwater. Death Valley Junction was just that: a junction of the Tonopah & Tidewater and a spur of the railroad to the company mines at Ryan. Death Valley Junction began life like most camps in the region: a tent town that appeared where there once were desert wastes only days before. A tent hotel, a tent saloon, a tent store and a few dwelling tents popped from the creosote and scrub on the edge of Ash Meadows. Death Valley Junction increased in size and prosperity around 1915 when new mines were found and the Death Valley Railroad was incorporated to build a line eastward to the site of New Ryan, on the very brink of Death Valley. Additional civic facilities were built and the town began to take on an air of permanence. Milling facilities for borax also added to the local economy, as well the town's location as a social center for the outlaying area. Pacific Coast Borax moved their mining activities in 1927 to a new mine closer to Los Angeles, but Death Valley Junction continued to thrive as a tourist destination. PCB constructed the facilities still used to this day - the popular and plus Furnace Creek Inn, and additional lodging at New Ryan. Tourism slowed down due to the Depression, although the creation of Death Valley National Monument in 1933 kept interest in Death Valley high. The Death Valley Railroad ceased operations shortly after the completion of mining at New Ryan, although the baby gauge railroad that ran from New Ryan into the extensive Widow Maker and Charley McCarthy Mines kept operating for the benefit of tourists until the late 1950's. In 1967, a new culture came to Death Valley Junction. That was the year that a New York ballet dancer, mime and artist had a flat tire in Death Valley. She's stayed there ever since. Marta Becket opened a theater of dance in the nearly abandoned hamlet, inside what was once the sprawling Amargosa Hotel, then in sad shape. She was tired of the stressful life of New York City and embraced the wide open spaces in which the tiny speck of Death Valley Junction sits. She is still dancing today*. Those who have seen her dance marvel at her talent for both the art of dancing and the art that graces the walls and ceiling of her theater. At first glance, those traveling through Death Valley Junction won't see much, but the area has many fascinating buildings left over from its once proud position in this region. Fragments of the two railroads and their once large rail yards are still standing or can be seen.